To report SUSPECTED ADVERSE REACTIONS, contact Northstar Rx LLC at 1-800-206-7821 or FDA at 1-800-FDA-1088 or www.fda.gov/medwatch. 600 mg: white, biconvex, elliptical, film-coated tablets, with deep break line on both sides and debossed with â€˜Dâ€™ and â€˜24â€™ on either side of the break line on one side and plain on other side. 800 mg: white, biconvex, elliptical, film-coated tablets, with deep break line on both sides and debossed with â€˜Dâ€™ and â€˜25â€™ on either side of the break line on one side and plain on other side. Patients taking gabapentin should not drive until they have gained sufficient experience to assess whether gabapentin impairs their ability to drive. Driving performance studies conducted with a prodrug of gabapentin (gabapentin enacarbil tablet, extended-release) indicate that gabapentin may cause significant driving impairment. Prescribers and patients should be aware that patientsâ€™ ability to assess their own driving competence, as well as their ability to assess the degree of somnolence caused by gabapentin, can be imperfect. 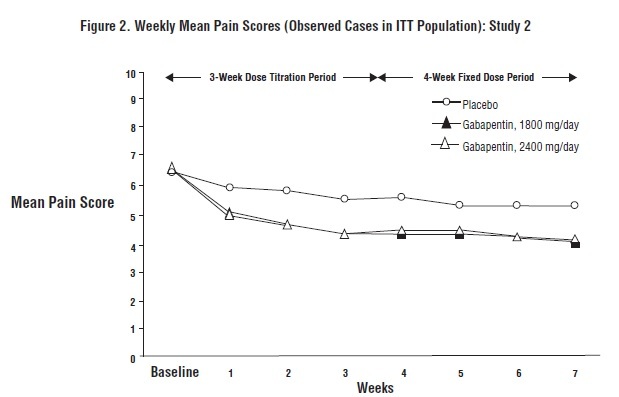 The duration of driving impairment after starting therapy with gabapentin is unknown. Whether the impairment is related to somnolence [see Warnings and Precautions (5.4)] or other effects of gabapentin is unknown. In an oral carcinogenicity study, gabapentin increased the incidence of pancreatic acinar cell tumors in rats [see Nonclinical Toxicology (13.1)]. The clinical significance of this finding is unknown. Clinical experience during gabapentinâ€™s premarketing development provides no direct means to assess its potential for inducing tumors in humans. In clinical studies in adjunctive therapy in epilepsy comprising 2,085 patient-years of exposure in patients >12 years of age, new tumors were reported in 10 patients (2 breast, 3 brain, 2 lung, 1 adrenal, 1 non-Hodgkinâ€™s lymphoma, 1 endometrial carcinoma in situ), and preexisting tumors worsened in 11 patients (9 brain, 1 breast, 1 prostate) during or up to 2 years following discontinuation of gabapentin. Without knowledge of the background incidence and recurrence in a similar population not treated with gabapentin, it is impossible to know whether the incidence seen in this cohort is or is not affected by treatment. Table 4 lists adverse reactions that occurred in at least 1% of gabapentin-treated patients >12 years of age with epilepsy participating in placebo-controlled trials and were numerically more common in the gabapentin group. In these studies, either gabapentin or placebo was added to the patientâ€™s current antiepileptic drug therapy. In a published study, gabapentin (400 mg/kg/day) was administered by intraperitoneal injection to neonatal mice during the first postnatal week, a period of synaptogenesis in rodents (corresponding to the last trimester of pregnancy in humans). Gabapentin caused a marked decrease in neuronal synapse formation in brains of intact mice and abnormal neuronal synapse formation in a mouse model of synaptic repair. Gabapentin has been shown in vitro to interfere with activity of the Î±2Î´ subunit of voltage-activated calcium channels, a receptor involved in neuronal synaptogenesis. The clinical significance of these findings is unknown. 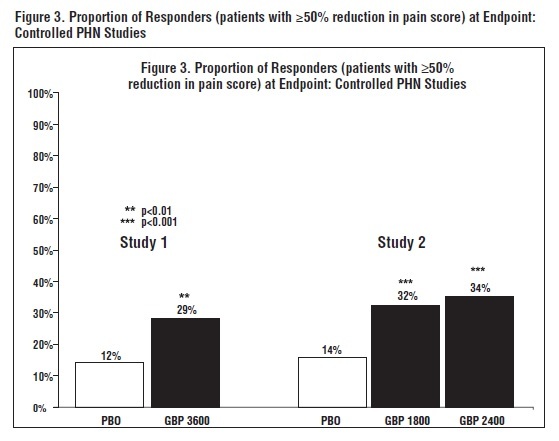 The total number of patients treated with gabapentin in controlled clinical trials in patients with postherpetic neuralgia was 336, of which 102 (30%) were 65 to 74 years of age, and 168 (50%) were 75 years of age and older. There was a larger treatment effect in patients 75 years of age and older compared to younger patients who received the same dosage. Since gabapentin is almost exclusively eliminated by renal excretion, the larger treatment effect observed in patients â‰¥75 years may be a consequence of increased gabapentin exposure for a given dose that results from an age-related decrease in renal function. However, other factors cannot be excluded. The types and incidence of adverse reactions were similar across age groups except for peripheral edema and ataxia, which tended to increase in incidence with age. Dosage adjustment in patients undergoing hemodialysis is necessary [see Dosage and Administration (2.3)and Clinical Pharmacology (12.3)]. Gabapentin USP is a white to off-white crystalline solid with a pKa1 of 3.7 and a pKa2 of 10.7. It is freely soluble in water and both basic and acidic aqueous solutions. The log of the partition coefficient (n-octanol/0.05M phosphate buffer) at pH 7.4 is â€“1.25. The precise mechanisms by which gabapentin produces its analgesic and antiepileptic actions are unknown. 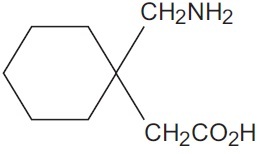 Gabapentin is structurally related to the neurotransmitter gamma-aminobutyric acid (GABA) but has no effect on GABA binding, uptake, or degradation. In vitro studies have shown that gabapentin binds with high-affinity to the Î±2Î´ subunit of voltage-activated calcium channels; however, the relationship of this binding to the therapeutic effects of gabapentin is unknown. Evidence of effectiveness was obtained in three trials conducted in 705 patients (age 12 years and above) and one trial conducted in 247 pediatric patients (3 to 12 years of age). The patients enrolled had a history of at least 4 partial seizures per month in spite of receiving one or more antiepileptic drugs at therapeutic levels and were observed on their established antiepileptic drug regimen during a 12-week baseline period (6 weeks in the study of pediatric patients). 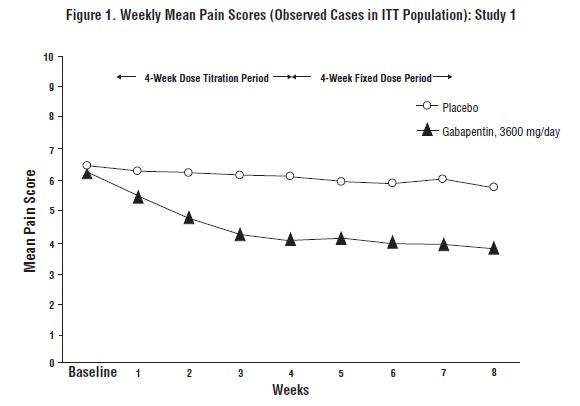 In patients continuing to have at least 2 (or 4 in some studies) seizures per month, gabapentin or placebo was then added on to the existing therapy during a 12-week treatment period. Effectiveness was assessed primarily on the basis of the percent of patients with a 50% or greater reduction in seizure frequency from baseline to treatment (the â€œresponder rateâ€) and a derived measure called response ratio, a measure of change defined as (T - B)/(T + B), in which B is the patientâ€™s baseline seizure frequency and T is the patientâ€™s seizure frequency during treatment. Response ratio is distributed within the range -1 to +1. A zero value indicates no change while complete elimination of seizures would give a value of -1; increased seizure rates would give positive values. A response ratio of -0.33 corresponds to a 50% reduction in seizure frequency. The results given below are for all partial seizures in the intent-to-treat (all patients who received any doses of treatment) population in each study, unless otherwise indicated. Gabapentin Tablets USP, 600 mg are white, biconvex, elliptical, film-coated tablets, with deep break line on both sides and debossed with â€˜Dâ€™ and â€˜24â€™ on either side of the break line on one side and plain on other side. 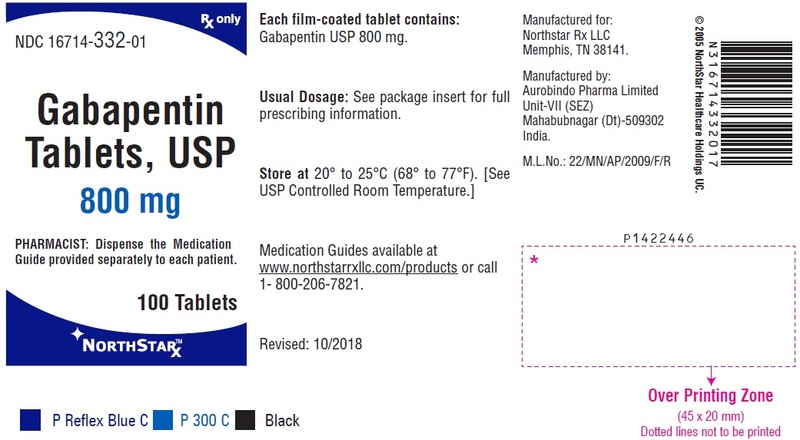 Gabapentin Tablets USP, 800 mg are white, biconvex, elliptical, film-coated tablets, with deep break line on both sides and debossed with â€˜Dâ€™ and â€˜25â€™ on either side of the break line on one side and plain on other side. Advise patients that gabapentin may cause dizziness, somnolence, and other symptoms and signs of CNS depression. Other drugs with sedative properties may increase these symptoms. Accordingly, although patientsâ€™ ability to determine their level of impairment can be unreliable, advise them neither to drive a car nor to operate other complex machinery until they have gained sufficient experience on gabapentin to gauge whether or not it affects their mental and/or motor performance adversely. Inform patients that it is not known how long this effect lasts [see Warnings and Precautions (5.3) and Warnings and Precautions (5.4)]. Medicines are sometimes prescribed for purposes other than those listed in a Medication Guide. Do not use gabapentin tablets for a condition for which it was not prescribed. Do not give gabapentin tablets to other people, even if they have the same symptoms that you have. They may harm them. * All brands listed are the trademarks of their respective owners and are not trademarks of Aurobindo Pharma Limited.